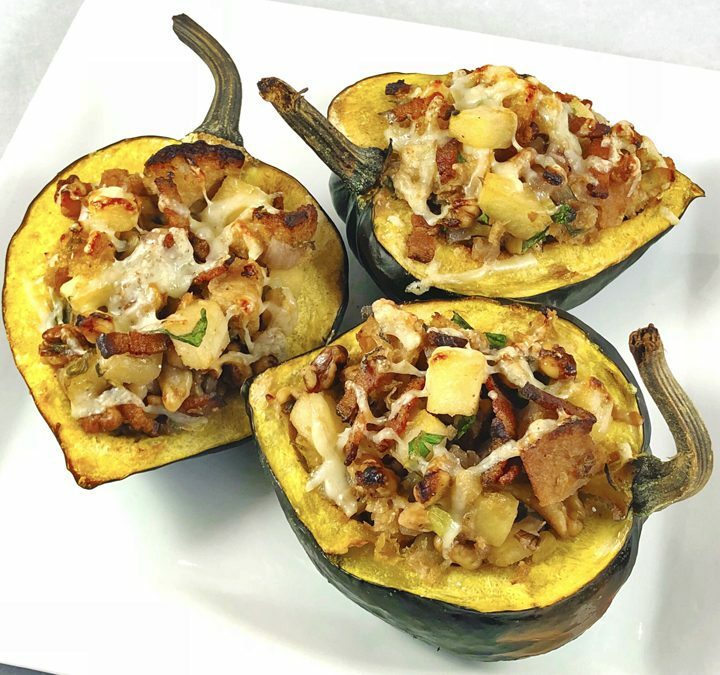 Loaded with vitamins, Acorn Squash has more potassium, calcium, magnesium, and folate than any other variety of squash. After baking the squash, we pile the center high with a flavorful stuffing including applewood smoked bacon, toasted walnuts, apples, gruyere cheese, and fresh fall herbs. Then sprinkled with more cheese, it’s bake until golden brown on top. Combine the melted butter, garlic powder, ½ teaspoon salt, ⅛ teaspoon pepper, and 2 teaspoons sage; brush over cut sides and cavity of squash. Place in a large roasting pan, cut side up, and roast in the oven for 1 hour, until the squash is tender but still holds its shape. While the squash bakes, sauté the bacon lardons over medium heat in a large sauté pan. Remove the cooked bacon lardons, drain on paper towels and set aside. Leaving the fat remaining in the pan, place the sauté pan back on the heat and add the onion and celery with a pinch of salt. Sauté until the vegetables are starting just to soften. Add the apples and sauté until the apple are soft and a small knife can pass through one of the apples. Add the croutons and walnuts to a large bowl. Pour the warm vegetables over the croutons and walnuts. Add the boiled cider, cooked bacon lardons, the rest of the sage, ⅔ of the gruyere cheese, the parsley, ½ teaspoon salt, and ⅛ teaspoon pepper. Mix well. Add evenly to the squash cavities and sprinkle with the remaining cheese. Place back in the oven and bake for 15 minutes. Makes 6 servings, serve immediately. 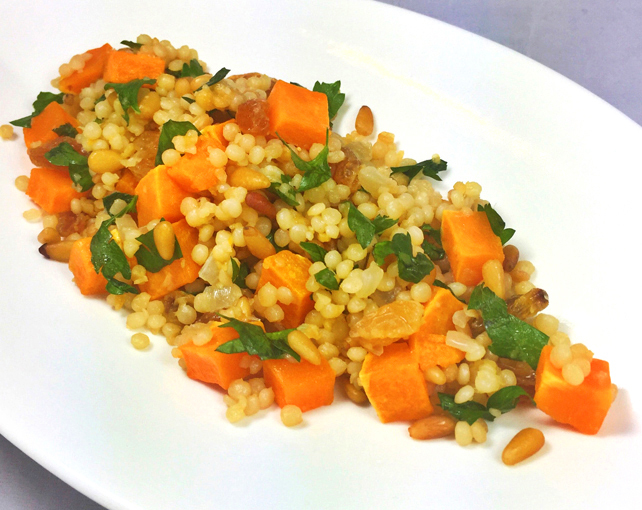 As a tasty side dish with meat, chicken, or burgers, our quick and easy roasted maple butternut squash pairs perfect with Israeli couscous, parsley, and pine nuts. Bring to your next seasonal get-together, tailgating, or as a side dish for any fall meal. Preheat the oven to 350 degrees. Add the butternut squash, 1½ teaspoons of olive oil, 1 tablespoon of pure maple syrup and ½ teaspoon salt to a bowl. Stir until well combined and pour onto a parchment lined sheet tray. Bake for 30 minutes or until a small knife easily passes through the squash. Remove from the oven and set aside. While the butternut squash bakes, add 2 teaspoons of olive oil to a saucepan over medium heat. Add the onion and sauté for 5 minutes. Add one cup of Israeli couscous and sauté for one more minute. Add 1 ¼ cups of chicken stock and ½ teaspoon kosher salt. Continue cooking for 8-10 minutes, or until the couscous absorbs all the stock and is tender. Remove from the heat and add the butternut squash, parsley, pine nuts, raisins, 1 tablespoon of olive oil, and 1½ teaspoons of fresh lemon juice. Season with salt to taste and serve warm or at room temperature. Make 4-6 servings. Sweet corn is at its peak, so take advantage with this recipe highlighting Polenta and sautéed sweet corn. Polenta refers to a porridge created from coarsely ground Italian cornmeal and is a dish from Northern Italy. 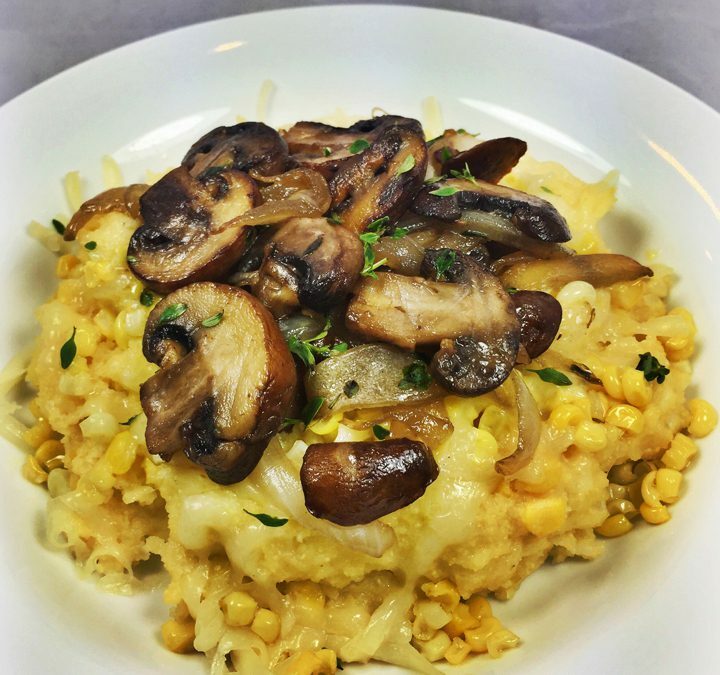 We top off this summer delicacy with butter sautéed sweet vidalia onions and mushrooms. In this recipe, we feature an easy corn stock to make for the Polenta to add just a touch more corn sweetness. If you have an extra hour – give it a try. We promise you won’t be sorry. No time to make stock? To keep it vegetarian, use boxed vegetable stock, or we also offer the option of boxed chicken stock. Remove the husks and silks from the corncobs. Using a sharp knife cut the corn kernels off the cobs. Place the kernels in a bowl, cover, and set aside. Discard the silks but save the husks and cobs if making corn stock (see directions below). If using vegetable or chicken stock, measure to the amount of liquid needed on the package of polenta, (note: the stock replaces the water needed to make polenta) cover, and gently heat to warm in a large saucepan. In a 10″ sauté pan heated to medium heat, add 2 tablespoons of butter with 2 tablespoons of oil. Add the corn and 1 teaspoon of salt. Sauté until the raw taste is gone from the corn, about 3-5 minutes. Remove from the heat, cover and keep warm. In a 12″ sauté pan over medium heat, add 2 tablespoons of butter and 2 tablespoons of oil. When hot, add the mushrooms in one layer and sear on each side, about 1 minute per side. Add the onions over the mushrooms and sprinkle the onions with a teaspoon of salt. Then stir together and sauté for 5 minutes or until all the juices have evaporated. Reduce the heat to low, add 1 teaspoon of fresh thyme, and cook on low until the onions are browned all over and softened. Add salt and pepper to taste. In the meantime, turn the heat up on the stock and bring it to a boil – if the stock has evaporated too much, simply add water to the amount needed to prepare the polenta. Prepare the polenta using the directions on the package. When all the water is evaporated and the Polenta is soft, add the remaining 2 tablespoons of butter and the Parmesan cheese. Stir until the polenta is creamy. If needed, add more butter, one tablespoon at a time, up to two tablespoons, to reach a creamy texture. Stir in the corn and season with salt and pepper to taste. Place the Polenta in warmed bowls, top with 2 tablespoons of Monterey Jack cheese then the sautéed mushrooms and onions. Top evenly with the remaining fresh thyme. Makes 4 entrée servings or six side servings. Place the corn husks, cobs, and onion in a large saucepan. Add 8 cups water and bring to a boil, then reduce to a simmer for one hour. Strain the stock into a clean pan or bowl through a fine mesh strainer and discard the husks, cobs, and onion. Place the strained liquid back on the stove and add 1 teaspoon of salt and the peppercorns. Bring the mixture back to a simmer and reduce until you have 4-1/2 cups of liquid remaining – about 15-20 minutes. Cover and keep warm. It’s time to picnic, and we have the perfect pasta salad. Delicious roasted vegetables are lightly dressed with a fruity olive oil and lemon juice, then topped with fragrant basil leaves. We also added crunchy toasted pine nuts for a great texture boost. Food safe at all temperatures – warm, room temperature, or cold – you can choose how you want to serve it. 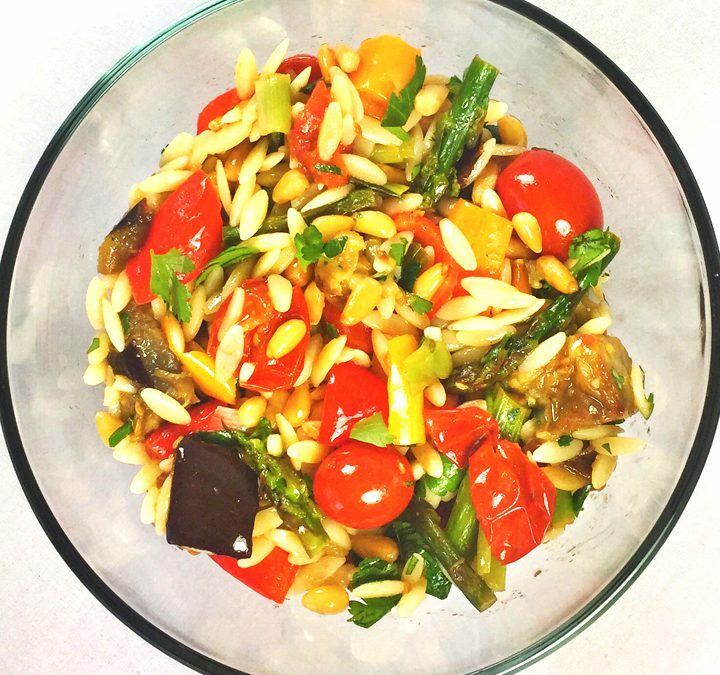 For a Gluten-Free version, try substituting with Gluten-Free Delallo Orzo Pasta. Preheat the oven to 350 degrees. Place the pine nuts on a baking sheet. Bake for 7-9 minutes or until the nuts turn golden. Remove from the oven and set aside to cool. Place the tomatoes and asparagus in a bowl. Add 2 tablespoons of olive oil and a big pinch of salt. Gently toss to combine well. Pour onto a sheet tray and bake for 10 minutes shaking the pan in between. Remove from the oven and add the vegetables to another large bowl. Leave the remaining oil in the pan. In the first bowl, add the onions and peppers. Add 1 more tablespoon of olive oil and a big pinch of salt. Gently toss to combine well. Pour onto the sheet tray and bake for 15 minutes. Using a spatula, turn the vegetables over at the halfway point. Remove from the oven and add the vegetables to the large bowl with the asparagus and tomatoes. Leave the remaining oil in the pan. In the first bowl, add the cubed eggplant. Add 1 tablespoon of olive oil and a big pinch of salt. Gently toss to combine well. Pour onto the sheet tray and bake for 20 minutes. Using a spatula, turn the eggplant over at the halfway point. Remove from the oven and add the eggplant and any remaining olive oil to the large bowl with the other vegetables. Bring a large pot of water to a boil. Add a handful of salt and cook the pasta following the package directions. Strain the water off and add the pasta to the vegetables. Toss gently to combine. Add the lemon juice, zest, toasted pine nuts and 1 more tablespoon of olive oil. Gently mix again. Taste and adjust seasoning with salt and pepper. Stir in the basil leaves. 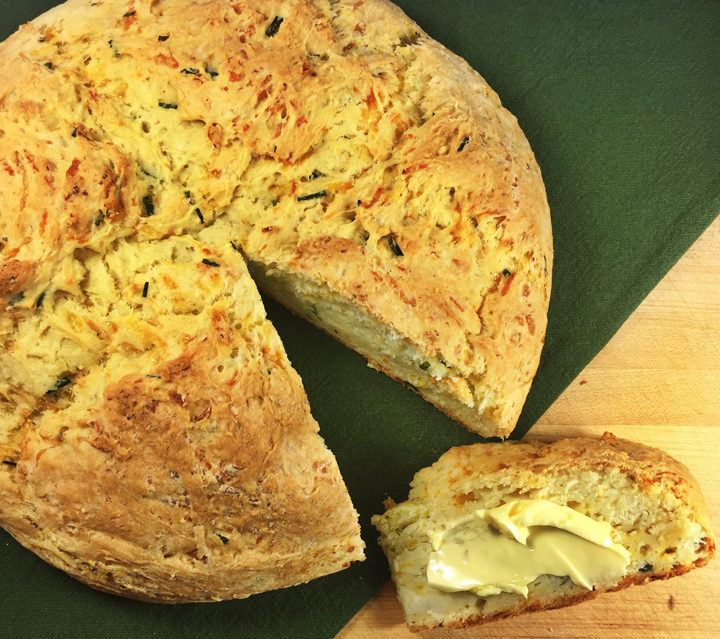 Bean Bakes are the perfect dish for potluck dinners, tailgating, or any fall event. A crossover between spicy chili and savoy baked beans, it’s a great companion dish for any menu. 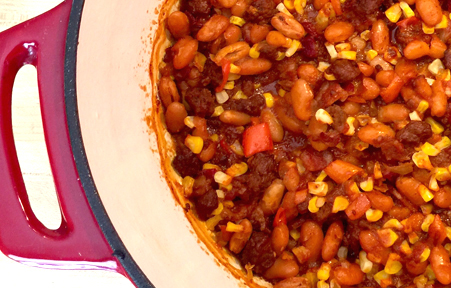 A flavorful combination of beans, corn, ground sirloin, and bacon, it’s delicious and filling as a side or main dish. Toasting and grinding whole spices does add more flavor, however to save time you can use ground spices and skip the first step. Preheat the oven to 350 degrees. If using whole spices, in a small sauté pan, toast until the seeds are light brown and fragrant. Cool slightly, and then grind in a spice grinder. In a small bowl, combine the brown sugar, ketchup, apple cider vinegar and mustard; set aside. Using a large oven proof casserole or dutch oven, set over medium heat and sauté the beef, bacon and onion. Cook until the meat is brown and the onion is tender. Drain off any fat. Add the spices and 1-1/2 teaspoons of salt and cook for another 2 minutes. Stir in the beans, corn and pepper. Stir the ketchup mixture into the bean mixture with ½ cup water and stir well. Place in the oven; cover and bake for 45 minutes, uncover and bake another 15 minutes. Rest 15 minutes and serve.